I can remember reading in an Oprah magazine a long time ago, that it takes 21 days to break a habit. After receiving a life changing phone call, I decided to change a ‘habit’ of hanging on to the past. So for 21 days I posted on facebook today is the first day of the rest of my life! It was amazing how many people clicked like, and did not comment that the same statement was hitting their feeds every day. But, I knew it was an affirmation. Each day that I wake up is the first day of the rest of my life. The really positive aspect of this affirmation is my new mantra not my life, not my problem. I am not going to be concerned about other people issues unless they directly affect my life. The one thing I am going to be concerned about is getting through my ever growing pile of recipes to test and books to read. I have good intentions at the start of each week, but I just cannot seem to get into the habit of making one recipe a day until my list is complete. So, this is going to be my next habit to learn. One of these numerous recipes was for flat bread. I saw it on the last series of Masterchef Australia and seeing how simple the recipe was, and the fact that I always have the ingredients to hand, you would have thought that I would have made it straight away. But it took forever for my to tick the box of tried and tested, and loved I might add! Do you have a habit you would like to learn? What a brilliant idea! I love that idea of publicly affirming your positive quote, not only are you doing good for you, but good for all those that read it too. Very cool! Hi Tandy, did not know that it takes 21 days, makes complete sense. Love this flat bread, looks so simple. Hi, Wow! I’m thinking that you really should do a video tutorial, your flat bread is amazing. Would love to be your neighbor. 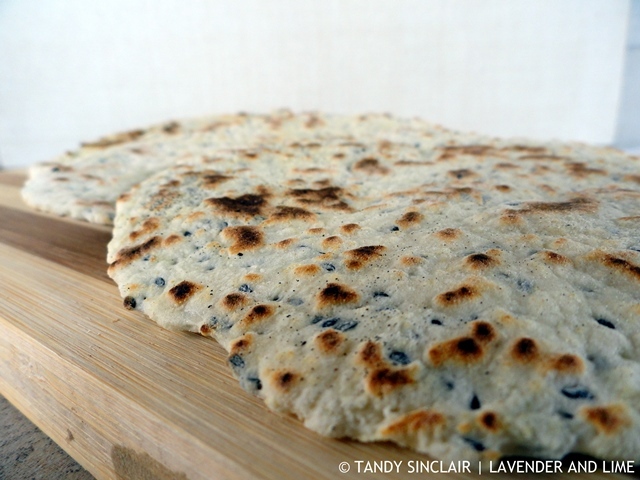 I make flatbreads similar to this all the time and I know how good they are! I saw your affirmations… lovely recipe, interesting that it has nigella seeds in it. I’ve never made flat bread. It looks delicious. I am ashamed of my ever growing pile of recipes to try! Love easy recipes like this. Have a happy evening Tandy.